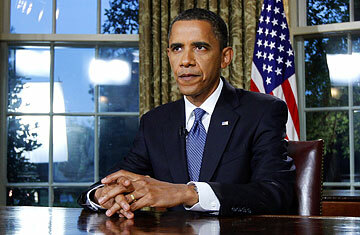 The BP oil-spill disaster must be one of the most confounding experiences of President Barack Obama's adult life. It's not that the man can't handle a challenge: he dove into a brutal campaign fight with Hillary Clinton in 2008 and took on the grueling cause of health reform despite his advisers' warnings. But the undersea BP gusher confounds many of his strengths. The environment has never been one of Obama's chief passions. Unlike the intricacies of health care or America's strategic posture, the oil well is largely a managerial challenge, not an intellectual one  and an inspirational call to action won't do much. What's more, the spill has put Obama in an absurd and impossible position. Pundits and Republicans are demanding that he do more, when in fact his power here is extremely limited  something Obama understands and probably resents. Perhaps that's why Obama's Oval Office speech Tuesday night seemed wan, even to some of his more reliable cheerleaders on cable television and in the blogosphere. Sure, Obama did an O.K. job explaining the scale of the government's response (30,000 personnel working across four states, plus 17,000 National Guardsmen deployed) to what he compared to "an epidemic, one that we will be fighting for months and even years." He conveyed toughness and decisive action with his plans for new management at the Minerals Management Service, a vow to extract fair compensation (with the help of a multibillion-dollar escrow account) from BP for the people suffering from the spill's effects and a promise to rebuild and restore the Gulf Coast. And his claim that BP in the next few weeks "should capture up to 90% of the oil leaking out of the well" at least showed the public a light at the end of the tunnel. But since Obama's inability to stop the leak limited the power of his address, he did his best to make the moment one about something larger: a shift away from fossil fuels that would make deepwater drilling obsolete, as well as limiting the pace of climate change. This is where his strengths would come in. Sweeping energy reform is a matter of offering a big vision, mustering political will and grappling with complex intellectual and policy questions. It is also an issue that requires bravery  bravery of the sort Obama demonstrated when he pressed on with health care, even after Scott Brown's victory. As he put it last night, "Time and again, the path forward [to energy innovation] has been blocked  not only by oil-industry lobbyists but also by a lack of political courage and candor." Still, Obama himself didn't show much of either. He never mentioned the phrases climate change or global warming. While he praised the House of Representatives for passing an "energy and climate bill" last year, he made no mention of a Senate proposal currently dying on the vine because it lacks the 60 votes needed to clear that chamber. Even worse, he made a vague case for energy reform that included piecemeal ideas like raising efficiency standards in buildings, and played the nativist card of warning about the growing clean-energy investments of China and India. And he offered no explanation of the cap-and-trade or carbon-tax ideas that so many Democrats consider essential to limiting greenhouse gases. That's nothing like how Obama would explain the problem in a private setting with trusted allies. But at a time when Obama's own approval ratings for his handling of the spill are dipping, the White House is reportedly worried that such talk polls poorly, especially among key swing voters. As a candidate, Obama repeatedly promised to tell Americans what they need to hear, not what they want to hear. That was among his most invigorating promises: a pledge to lead, to cast aside the poll-driven positioning that prevented America from solving its most persistent problems. In the first Oval Office address of his presidency, Obama didn't do that, and he must know it. Which must be the most frustrating thing of all. See 12 people to blame for the oil spill. Watch TIME's video "The Oil Spill by the Numbers."